Join the Boy Scouts in Troop 147, chartered to the Franklin Reformed Church for over 97 years! 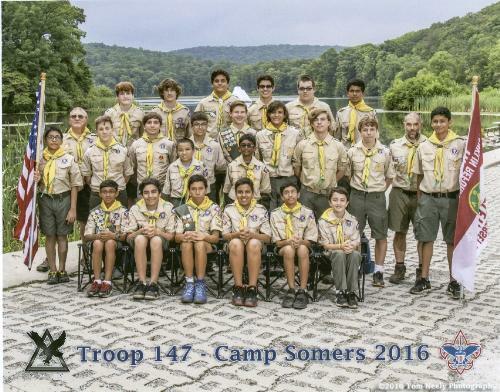 This troop has produced 122 Eagle Scouts and a great deal of learningand fun for everyone! · Our Scoutmaster is Al C Welenofsky.He has been involved with Scouting and Troop 147 since 1950 and is an adventurer and world traveller. · We have a Troop Committee primarily made up of parents who provide the support necessary for the troop program to operate. · Parents are welcome to help, however it isn’t necessary. Some are quite involved, others provide help when they can and others have busy lives. All are okay with us. · The troop meets at the Franklin Reformed Church Community House on Tuesday nights from 7:30PM to 9:00PM during the school year. When the schools are closed, so is the troop. Often when the schools are closed there are some people at “unofficial” meetings but attendance in uniform isn’t required. · The troop attempts to go camping or to a Scout activity each month. A calendar is available. The camping trips go on rain or shine. If a major weather event requires cancellation, the Patrol leaders will be notified. 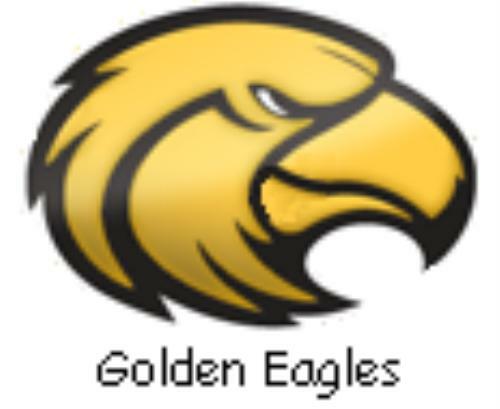 · Parents are welcome to go on our events but are not required. Parents doing so are strongly suggested to take the online Youth Protection Training. See on the reverse how to access the training online. 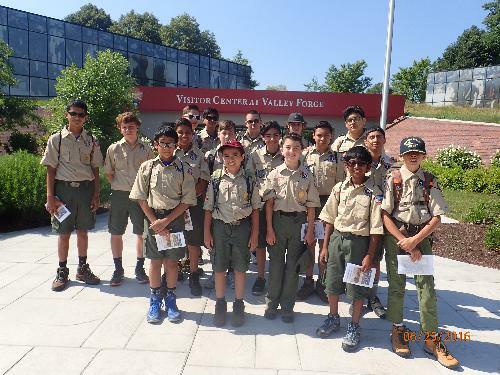 · The troop normally attends a week long summer camp each year as it’s a great experience and a good opportunity to complete merit badges in preparation for rank advancement. · Dues are collected once a year in the November to December timeframe in time for our annual re-charter. Currently dues are $70 most of which includes the BSA registration and insurance fees and a subscription to Boy’s Life magazine. Dues are prorated monthly for Scouts joining in mid-year. · A good four season sleeping bag is necessary as we camp year round in all types of weather. Documents are available detailing equipment needed for camping trips. · The troop doesn’t maintain tents for scouts. Scouts must have access to a tent for camping. Often a fellow scout has one. We often use the Rifle Camp campground at the Garrett Mountain reservation where there are lean-tos available. A scout must know where he is sleeping prior to leaving for the trip. · The troop has cooking kits for each patrol when the patrol iscooking. The kits contain everything needed for a weekend camping trip. The cost of the food and supplies consumed is shared equally by the Patrol members. · Sometimes the troop goes to activities where the cooking is done by the Leaders and all the equipment is provided for that. The cost of the food and supplies consumed is a part of the individual activity fee. · Your next step is to get a Scout Handbook and the latest Boy Scout Requirements book. Although the BSA joining requirements are in the BSA Scout Handbook, they are included below. The requirements book has all the requirements for all Merit Badges, Ranks and Awards. They are available at the Scout Shop at the Northern New Jersey Council office located in Oakland, NewJersey. They can also be ordered online at www.scoutstuff.org. 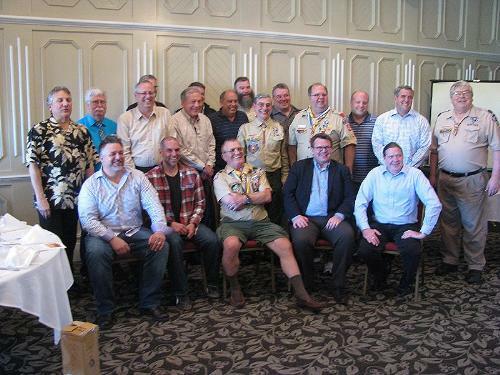 · Contact one of the leaders for a Boy Scout application and health forms. More information including uniform requirements, camping equipment, a calendar of events and a phone list will be provided as well. a. Repeat from memory the Scout Oath,Scout Law, Scout motto, and Scout slogan. In your own words, explain their meaning. b. Explain what Scout spirit is. Describe some ways you have shown Scout spirit by practicing the Scout Oath, Scout Law, Scout motto, and Scout slogan. c. Demonstrate the Boy Scout sign, salute, and handshake. Explain when they should be used. d. Describe the First Class Scout badge and tell what each part stands for. Explain the significance of the First Class Scout badge. f. Repeat from memory the Pledge of Allegiance. In your own words, explain its meaning. c. Describe what the Boy Scout ranks are and how they are earned. a. Explain the patrol method. Describe the types of patrols that are used in your troop. b. Become familiar with your patrol name, emblem, flag, and yell. Explain how these items create patrol spirit. a. Show how to tie a square knot, two half-hitches, and a taut-line hitch. Explain how each knot is used. 5. Demonstrate your knowledge of pocket knife safety. 7. Since joining the troop and while working on the Scout rank, participate in a Scoutmaster conference. ·The Boy Scouts Requirements book contains all requirements for allMerit Badges, Ranks and Awards. Some requirements change over time. The requirements book is the bible for anything started in that year. ·Adults who register are required to complete the on-line Youth Protection Training. We strongly suggest that unregistered parents who attend our events also take this training. It can be found at https://my.scouting.scouting.org/. Create an account, logon, select the Home button in the upper left corner, then My Dashboard in the menu list. It will default to the My Training section and YPT which displays the Youth Protection training courses available. Select Take Course to proceed. Anyone can take the course even if not registered with the BSA. It will let you know how we operate and how we protect our Scouts. All the available courses can be taken by anyone as well. Nutley Scout Troop 147, sponsored by the Franklin Reformed Church held an Eagle Scout Court of Honor on October 16th, 2018, to present Scouting's highest award to four Scouts , Anthony Gingerelli, SuvanBhat, Frank Bartell, and Bhuvan Dave. Senior Patrol Leader Jake Shoemaker opened the evening ceremony by leading six new Scouts in a tribute to one of our nation's symbols, the Bald Eagle. Each new Scout read an excerpt about this majestic bird which was followed by the Flag Salute, Scout Oath, and Scout Law. Reverend Jill Fenske, Pastor of the Franklin Reformed Church, gave the invocation and also thanked the Scouts for the Eagle Scout service projects they did to benefit the church. Scoutmaster Al Welenofsky then presented rank advancement certificates to Clark St. Amant for Tenderfoot, Ethan Wanko for Second Classand First Class, Rishi Bhandari and Praneth Kumara for First Class, and Vipul Kothakonda and Archer St. Amant for Star Scout. 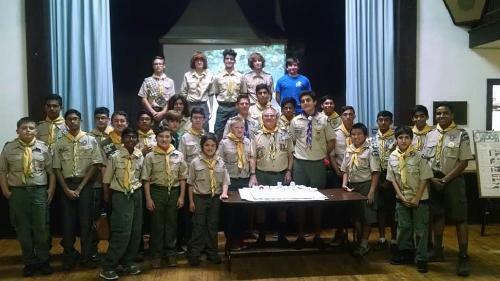 This was followed by 21 Scouts receiving certificates for 108 merit badges earned at Scout summer camp. Archer St. Amant received the Troop's Summer Camp Merit Badge Champ Certificate for earning seven Merit badges. 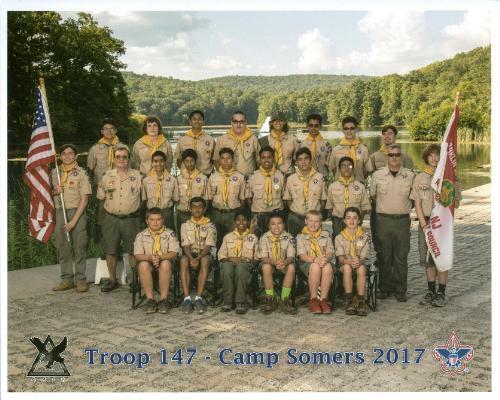 Vipul Kothakonda was voted the Troop Honor Camper and received a certificate and badge for this honor. This tradition was started 58 years ago. Scott Bolton Jr. was the only Scout from the Troop to complete the Mile Swim BSA Award at summer camp and received the appropriate badge and certificate for his effort. Ethan Wanko was the ninth Scout from the Troop to complete the Catskill Mountains "5 Fire Tower Challenge" when he, with his dad, climbed Tremper Mountain, a six mile round trip hike, two days before the Eagle Scout Court of Honor. He received his "Tower" badgefor his accomplishment. 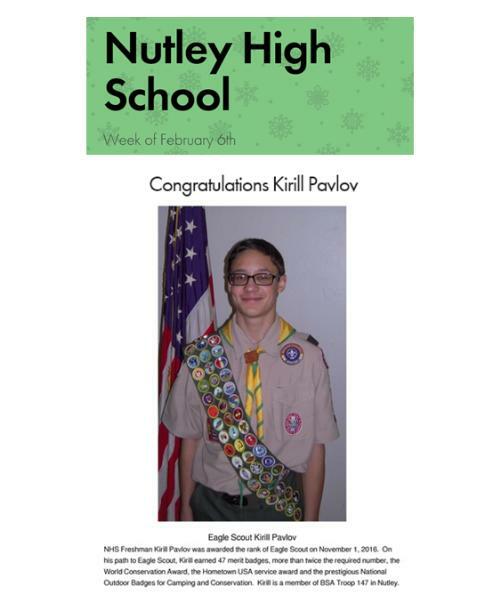 Eagle Scout Kirill Pavlov, who became the Troop's 122nd Eagle Scout in 2016, received his 4th Silver Palm and currently has earned 85 merit badges. A Certificate of THANKS was presented to Troop Committeeman Scott Bolton Sr. for his outstanding help and contributions towards the Scout Troop. Scoutmaster Al then asked the four new Eagle Scouts and their parents to step up to the stage for the Eagle Scout Court of Honor phase of the evening. 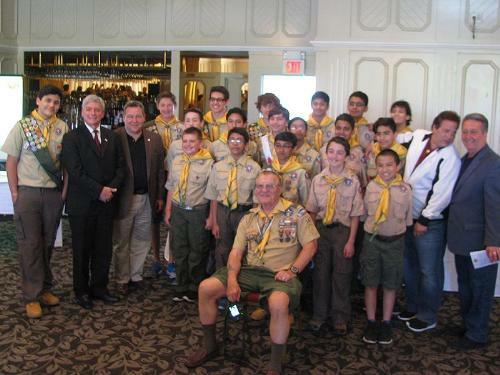 With the assistance of Committeeman Dave Dey, letters of congratulations from Nutley Mayor Dr. Joseph Scarpelli, Northern New Jersey Boy Scout Council President Mr. Philip Mollica, and Northern New Jersey Council Scout Executive Ms. Rebecca Fields were read to the new Eagle Scouts. They also received letters and commendations from President Donald Trump, NJ Senator Cory Booker, US Congressman Rodney Frelinghuysen, NJ Governor Phil Murphy, The American Legion, National Park Service, VFW, and NASA. Welenofsky then presented the Eagle Scout medal to the mothers of the Eagle Scouts who then pinned the medal on their son's uniform. Each Eagle Mom and Dad received a small Eagle pin which they agreed to wear proudly. Eagle Scout Anthony Gingerelli, a Nutley High School Senior, also received a Silver Palm for having earned 15 merit badges beyond the 21 required for Eagle Scout. His Eagle Scout Service Project involved the beautification and landscaping at the front entrance of the Franklin Reformed Church Community House where he led eight Scouts and two adults totaling 66 hours of work. Anthony had served as Senior Patrol Leader of the Troop for three years and is currently a Junior Assistant Scoutmaster. Eagle Scout Suvan Bhat, a St. Peter's Prep High School High Honors Junior, also earned a Silver Palm with his Eagle medal. Suvan's Eagle Scout Service Project was constructing four kid’s benches for the Nutley Public Library children's room. He led nine Scouts and three adults working a total of 70 hours. Suvan, currently an Assistant Senior Patrol Leader, is also a Scholarship Merit Badge Instructor, Troop Bugler, and a past Patrol Leader. Eagle Scout Frank Bartell, a Nutley High School Senior, earned a Bronze Palm with his Eagle Medal. His Eagle Scout Service entailed logging the Church's records of all the deceased people in the Franklin Reformed Church Cemetery, a most necessary and appreciated project expressed by Reverend Jill Fenske to bring this portion of the Church's records up to the computer age. Frank led five Scouts and two adults in 180 hours of work. Frank, a past Patrol Leader, is currently a Junior Assistant Scoutmaster. Eagle Scout Bhuvan Dave, the Troop's 126th Eagle Scout, is a Nutley High School Junior. Bhuvan also earned a Bronze Palm with his Eagle Medal. His Eagle Scout Service Project involved grounds cleanup and landscaping at the Nutley Public Library. Bhuvan led seven Scouts and one adult in his project which totaled 63 hours of work. Bhuvan is currently serving as the Troop Guide and Webmaster, and is a past Patrol Leader. All four boys are members of the Order of the Arrow, the National Honor Society of the Boy Scouts of America. Scoutmaster Al Welenofsky became the Troop's eleventh Eagle Scout having earned the award in 1952, and of the Troop's 126 Eagle Scouts in the 98 year history of Troop 147, Welenofsky, as Scoutmaster, claims 73 of them. After the medal ceremony, each new Eagle Scout acknowledged their honor with a brief "Thank You" to those who helped them along the way in reaching this goal, attained by only four percent of Scouts nationally, and they also added a fond memory account of their time in the Troop, plus a challenge to the younger Scouts to attain this high honor. The evening concluded with the Senior Patrol Leader leading the Scouts in the Scout Benediction. 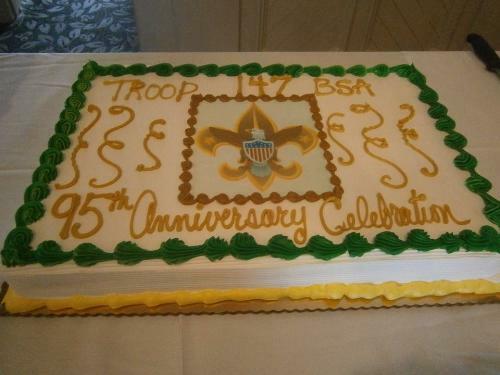 This was followed with refreshments which included an Eagle Scout decorated cake with the names of the four new Eagle Scouts, all donated by the parents and families of the Scouts. 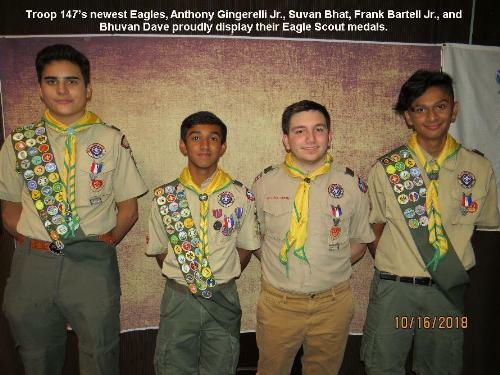 Picture Caption: Troop 147’s newest Eagles, Anthony Gingerelli Jr., Suvan Bhat, Frank Bartell Jr., and Bhuvan Dave proudly display their Eagle Scout medals. Troop 147 takes first in 2018 Klondike Derby! Nutley Boy Scout Troop 147 placed first in the Lenape Trail District's Annual Klondike Derby, an all-day event held Feb. 3rd at the South Mountain Reservation in West Orange. The Klondike Derby is an annual event that tests the Scouts on their outdoor survival skills. The event takes its inspiration from prospectors who, during the 1890s, used dog sleds to travel through Alaska and Canada insearch of gold; the cold, harsh conditions forced them to use outdoor survival skills. There was plenty of sun but no snow at this year's event, so the Scouts had to drag their Klondike sleds over a frozen grass field to visit the 10 "towns" or stations, each one testing them on a different Scout skill. Troop 147's BEAV-HAW Team -- Jose Medrano, Scott Bolton Jr., Aakash Patel, Bhuvan Dave, Alvaro Flores, Archer St. Amant, and Rishi Bhandari, led by co-captains Suvan Bhat and Kirill Pavlov -- amassed 920 points, besting the Dragons from Troop 17 from Short Hills by five points to win the competition.The Beaver Team from Troop 21 in Maplewood finished third. The Lenape Trail District is one of three districts in the Boy Scouts' Northern New Jersey Council and includes all towns in Essex County. Al's birthday and we're up to 34 Scouts! A total of 109 Merit badges were earned at camp this year! We will have a Court of Honor/Parent’s Night in October where the badges will be presented. Suvan Bhat was this year’s Merit Badge Champ with 8 Merit Badges earned, The troop had another successful Summer Camp. Everyone had a great time at our 95th Anniversary Celebration!